While I was accepting exhibits for our county fair, a man came with honey. A man who only lives about 10 miles from our place. Of course I had to ask if he had bees, which of course he did. So we got chatting and long story short, he offered to come check our hive and help us out a bit with our bees as we still are below novice in the bee department. He came over with his smoker, suit, veil, etc. and we took him out to the hive. But when we opened the hive, there were only a handful of bees in it. Turns out we should have had the second box on them right after getting them home since they were already established and the trays in the first box were already mostly full at that point. So, at some point between when we had our other friend check them and when this guy opened the box, they swarmed and found somewhere else to live. Very disappointing. I had not been out to check them for a long time, but hadn’t been concerned about them because they are regular visitors to the herb garden. 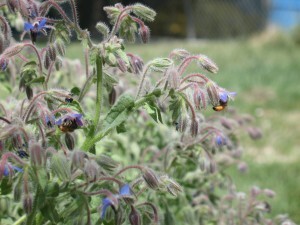 They especially like the borage. There are 5-8 bees at our little borage patch every time I go out there. So our new bee friend left us with some good advice, a list of things we’ll need, and we’ll start again with a new bunch of bees next spring. We cut the honey that was left in the hive out, so it’s not a total loss and sweet husband will be cleaning out the rest of the hive slats and getting new foundation for them and a “super” so the bees can have two boxes to live in and we get the super for our honey. Maybe we’ll get this to work next year. Especially now we’ve got a super helpful friend in the bee hobby that doesn’t live too far away to help us out. Oh, that is so disappointing. Should the first person have told you that? I want bees some day, so I am trying to absorb bee wisdom and profit from others’ lessons learned. I would think he should have told us. He did tell us a lot of things, but nothing to the effect of “You should probably get that second box on top pretty soon”. Oh well. Hubby’s already been talking with our new bee friend more about what to do with the hive boxes now while we’re waiting for spring. How much honey were you able to get from your bees? Do you think it is worth it to have a hive? Is it cheaper than buying it from the neighbor? We got a small bucket about half full, but that was mostly from the box that we didn’t use so it was leftover from whatever bees used it before we bought it. I’m not sure how much you’d get from one hive of bees, but with the price of honey and the way my kids can eat it, I figure it will eventually pay for itself. It’s been kind of a hefty up front investment, though. Thanks for sharing this information. We don’t have bees right now but we’re planning to some day (hopefully soon). Prep one of the best ways to get bees is to advertize. Next spring place an ad in your local craig’s list that your are looking for a swarm. Many home owners are looking for someone to take them out of thier bushes. You will also get calls for removing them from buildings. Give them your beekeeping friends number. (cutouts require more expertize)Ssound like your hive had more problems than having swarmed. (Mites) The hive if it swarmed should have raised a queen to replace the older one that left with the swarm.